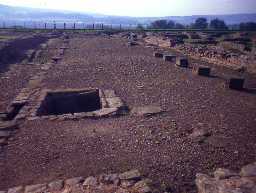 Corbridhe Roman Town. Photo by Harry Rowland, 1994. 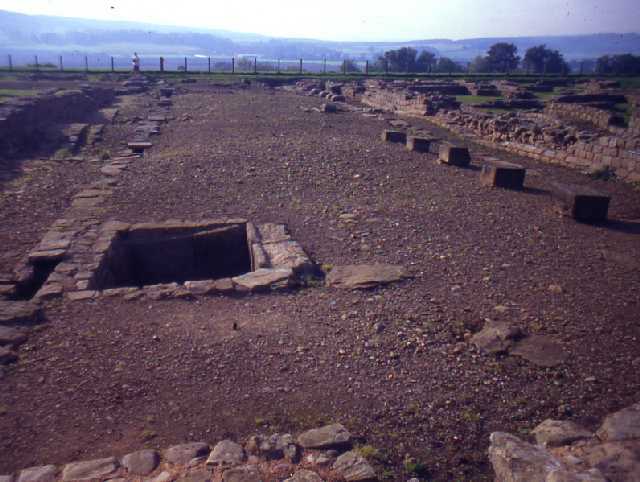 The extensive remains of a major Roman town and supply base for Hadrian's Wall stand just west of the present village of Corbridge. The earliest structure was a timber supply base probably built by Agricola in the first century AD, before Hadrian's Wall was built. This was replaced by a turf and timber fort which protected Dere Street, the main road from York to Scotland, where it crossed the River Tyne. A series of at least five other forts were laid out on the site over the following years., each slightly altering the internal plan of the fort but largely keeping within the existing ramparts and ditches. This development continued until about the AD160s. At this time the Antonine frontier in Scotland was abandoned and the fort seems to have undergone a drastic change in appearance. The ramparts were levelled and most of the buildings demolished, the granaries were rebuilt in a more massive style, and a large courtyard building and an elaborate aqueduct and fountain were built. However, excavations have shown that these ambitious plans got little further than foundation stages before being abandoned. Other developments took place to the south with small properties including a pottery shop or warehouse, possible workshops, administrative block and substantial houses. These buildings were in probable military compounds, protected by a substantial wall. The later history of Corbridge, in the third and fourth centuries remains unclear. Excavations at Corbridge have unearthed many fine finds, from sculptured stones to a hoard of metal and other objects buried in a wooden box. Some of the discoveries date to earlier and later periods and include Iron Age metalwork and early medieval finds. Today the site is run by English Heritage and the remains of stone buildings can be seen and many of the finds are on display in the site museum. This is a Scheduled Monument protected by law.